It seems like a week that calls out for the quiet satisfaction of comfort food. Extreme weather conditions are delivering a bitter cold in so many parts of the country. This is a dessert designed to take the edge off a blizzard. If you find yourself snowed in, you probably have rice on hand since it's a staple in cupboards throughout the world and an integral part of meals in just about every culture. Rice pudding has the benefit of being relatively inexpensive as desserts go and it delivers a soothing pleasure for times like these. My rice pudding errs on the side of being cushy and creamy. Pre-cooking the rice for a few minutes shortens the simmering for quicker preparation. I choose long grain rice, which is less starchy than short grain. And for a low simmer, I use milk because it reduces more evenly than cream, which can leave the pudding with a fatty and dense chewiness. You can always add cream at the end of the cooking if you want more richness. I love the aromatic spices found in a steaming hot cup of Indian masala chai, so I add them to this mixture for more flavor and warmth. And since chai is personal to the maker, you can add or subtract spices to your own taste. 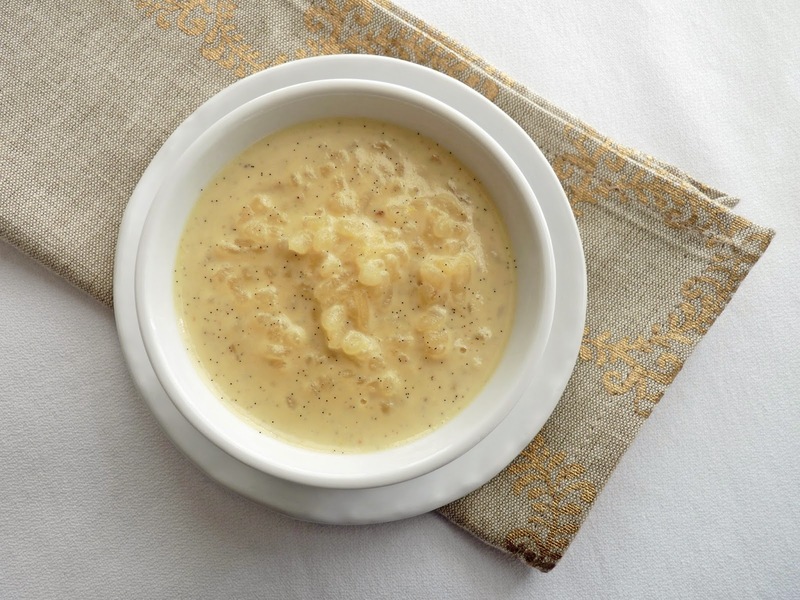 Bundle up and share a hearty bowl of warm rice pudding. Stay safe out there. - Traditionally, chai is made from Assam tea but any good black tea will do. Tea bags are definitely convenient but there is a difference in quality with loose leaf tea, which tends to have a brighter taste. Tea bags contain much of the fannings, the smallest pieces of broken tea with essential oils that are dimished. - If you don't have a vanilla bean, add about 1/2 teaspoon of vanilla extract at the end when you've taken it off the heat. 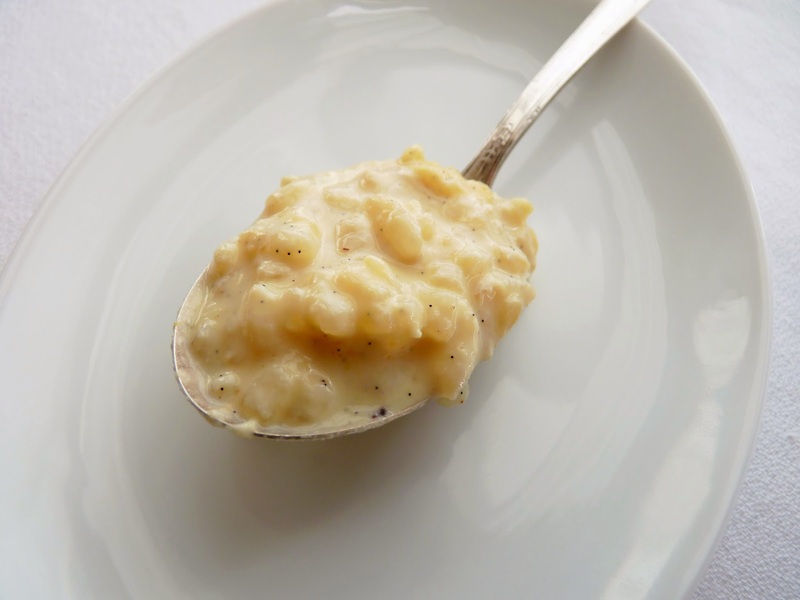 - Rice pudding doesn't require much sugar in order to taste sweet but add or subtract to your own taste. 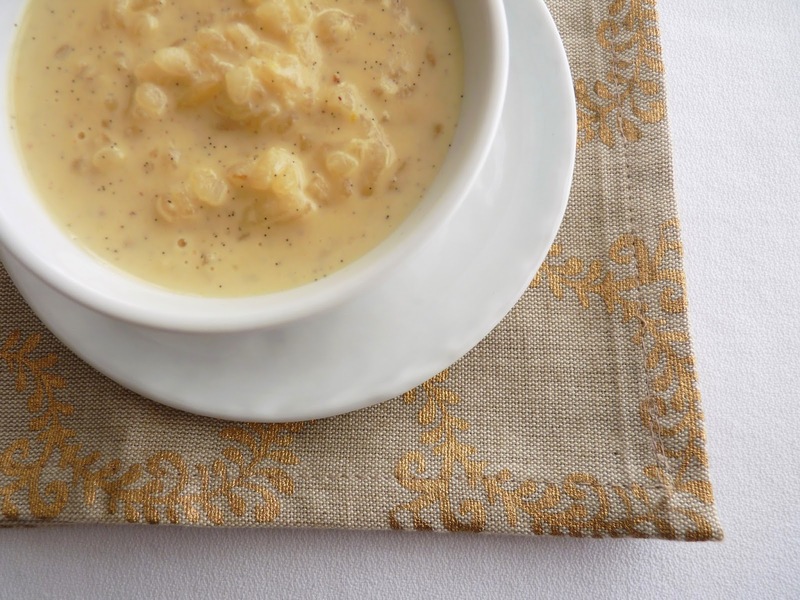 - Cook the rice pudding at a very low simmer to keep it from boiling. Your goal is to tenderize the rice and reduce the milk. Stir gently to prevent the grains from breaking. 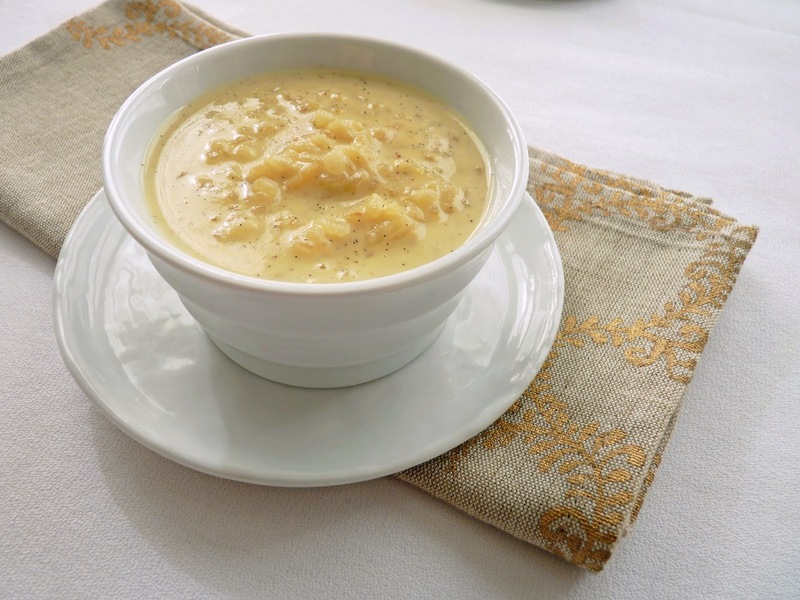 - The pudding will look soupy but resist the urge to cook it longer or it may become too gloppy and thick. - Salt is very important in dairy desserts. If the pudding has a flat taste, keep adding a few more grains of salt until the flavor pops. - Rice pudding tightens a lot as it cools, especially if refrigerated. Add a splash of warm milk or cream to loosen it up. - For added richness and a more custardy texture, once the pudding is finished cooking, place about a cup of it in a bowl and thoroughly whisk in 2 egg yolks. Pour this back into the pan and cook very gently on low heat, stirring constantly to prevent scrambling, for 2 additional minutes. Place the rice and water in a saucepan and bring to a boil. Lower heat to a bare simmer, cover the pan and cook the rice for 8 minutes. Warm the milk on medium low heat just until bubbles form around the edges. Remove from the heat and add the tea. Steep for 8 - 10 minutes, depending on the quality of your tea. Strain out the loose tea or remove the tea bags and add the remaining ingredients, stirring to combine. Bring the mixture to a boil and then reduce the heat. Cook at a very low simmer for 20 - 25 minutes until the rice is tender. Stir frequently to keep the rice from sticking to the bottom of the pan, especially toward the end of the cooking time. The pudding should be a bit soupy. It will firm up more as it cools. Take off the heat and remove the spices. Taste and adjust for salt, if necessary. Serve warm. 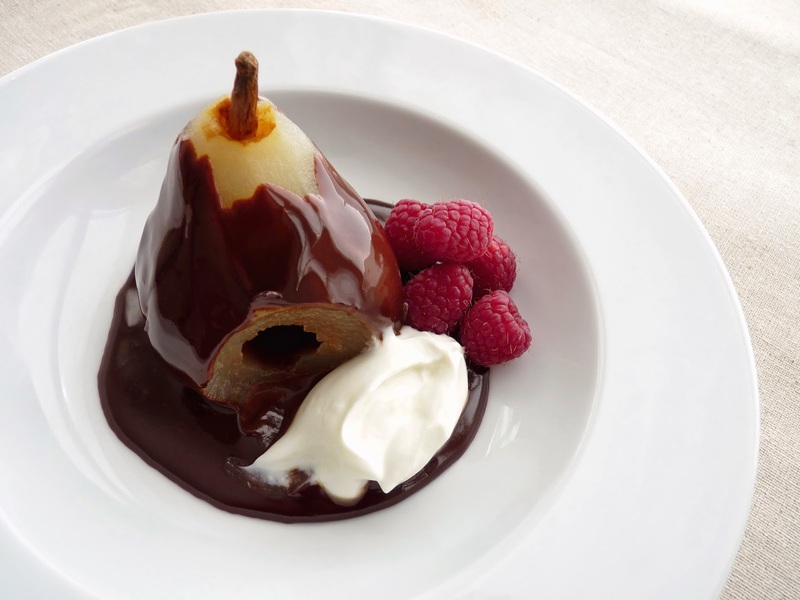 Whenever you're in the mood for a classic dessert, this pairing of poached pear and chocolate is a delicious answer. It's simple, satisfying and a great reminder of how good this kind of basic preparation can be. It doesn't require that you turn on your mixer or oven and it's a wonderful dessert for those who are looking for something gluten free. Pears Belle Helene have an interesting little story. It starts with the great August Escoffier in the era of the late 1800s - early 1900s. A French chef and restauranteur, he was among the first to take the lead in culinary writing and cookbook development, the modernization and accessibility of French cuisine and the professionalization of kitchen organization and management. His work to interpret and simplify Marie-Antoine Careme's methods and technique is legendary. He was also instrumental in the creation and partnership of the professional kitchens of the Ritz-Carlton in 1898-1899. Escoffier created Poires Belle Helene in 1864 in celebration of the popularity of the operetta, La Belle Helene, which was based on the life and times of Helen of Troy. 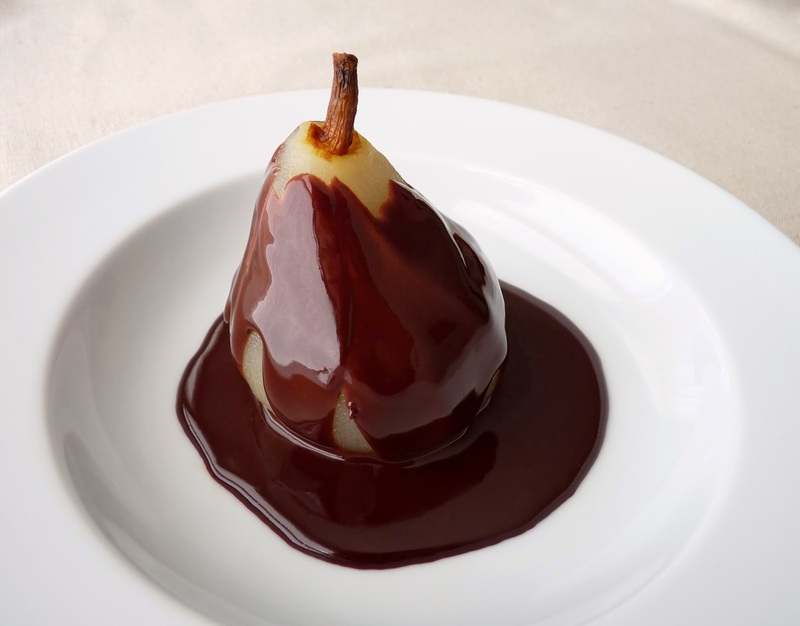 Escoffier served the poached pears with chocolate sauce and vanilla ice cream and embellished them with crystallized violets. Later versions replaced the violets with sliced almonds. I chose to simplify the plating with a dollop of sweetened whipped cream along with the note of color and tartness of some fresh raspberries. I've changed up the chocolate sauce only ever so slightly by adding a touch of cardamom and allspice just to introduce some intrigue. These are easily omitted if you care to stay with the classical approach. - Fresh pears should be ripe but firm. Bosc pears hold up best for poaching but I've also used d'Anjous. 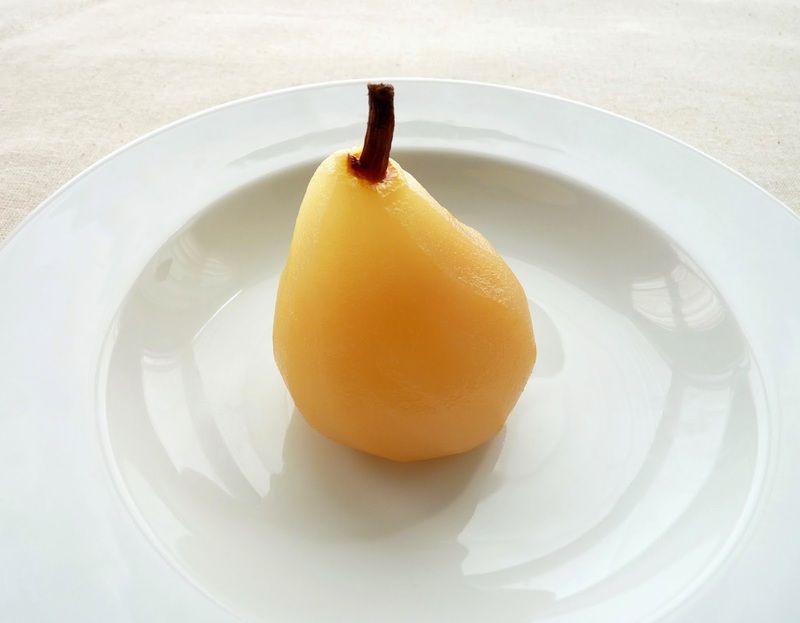 - Poaching pears is fairly simple. Make sure your poaching liquid covers your pears by about an inch or so. The ratio for the liquid is roughly 4 parts liquid to 1 part sugar. You can replace some of the poaching water with wine. Flavorings can be thyme or rosemary, cinnamon sticks, star anise, clove, peppercorn or sliced ginger, with various combinations therein. - When poaching pears, cut out a circle of parchment to fit the diameter of your saucepan. Place it directly on the surface of the liquid to keep the moisture on the fruit. This will ensure slow, even poaching and help to keep the pears from turning brown. - Pears can be stored submerged in their poaching liquid in the refrigerator for about 4 - 5 days. Bring to room temperature to serve. - Keep the poaching liquid at a low and gentle simmer to preserve the flavor and structure of the fruit. 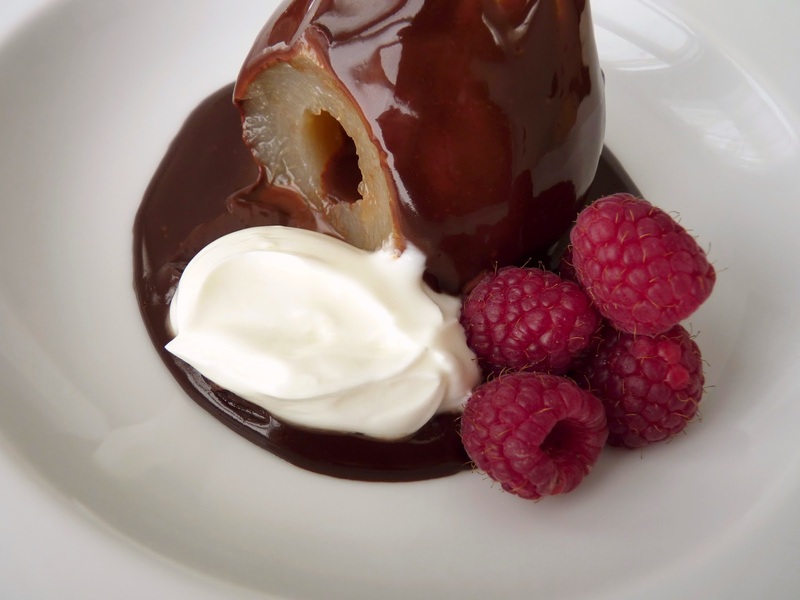 How long it takes to poach pears depends on their ripeness. They should be tender and easily pierced with a knife but not mushy. Turn off the heat when you think the pears are nearly done. They will continue to soften slightly as they cool in the liquid. Undercooked pears may turn brown. - You can reduce the poaching liquid until slightly thickened and syrupy. Use it to flavor drinks or to serve over cake, yogurt or ice cream. Combine the water, sugar, lemon, bay leaf and vanilla bean in a saucepan over medium heat. Bring to a boil until the sugar is dissolved. Lower the heat so the liquid is at a low simmer. Peel and core the pears. Slice just a bit off the bottom so they can stand upright on a plate. Add them to the poaching liquid and place a circle of parchment directly on top of them. Poach at a low simmer until tender, about 25 - 30 minutes. Remove from the heat and cool the pears in the liquid. For the chocolate sauce, finely chop the chocolate and place in a heatproof bowl. Add the cream, corn syrup and spice and place over a pan with about 2" of barely simmering water. Stir gently until the chocolate is melted and glossy. Remove from the heat. To serve, drain the pears on a paper towel. Whip the cream with the sugar until soft peaks form. Place each pear on a serving plate and pour warm sauce over them. Garnish with raspberries and whipped cream. 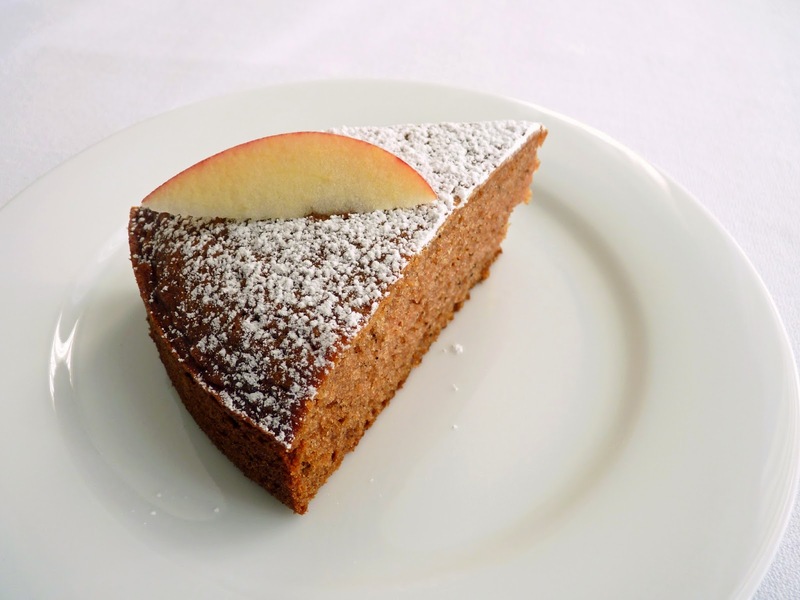 This is a good time to bake an old-fashioned applesauce cake. As I was shuffling through my huge stash of recipes, this particular one jumped out at me. I needed to use up some applesauce and this struck me as something I could do in just a few minutes with minimal muss or fuss. 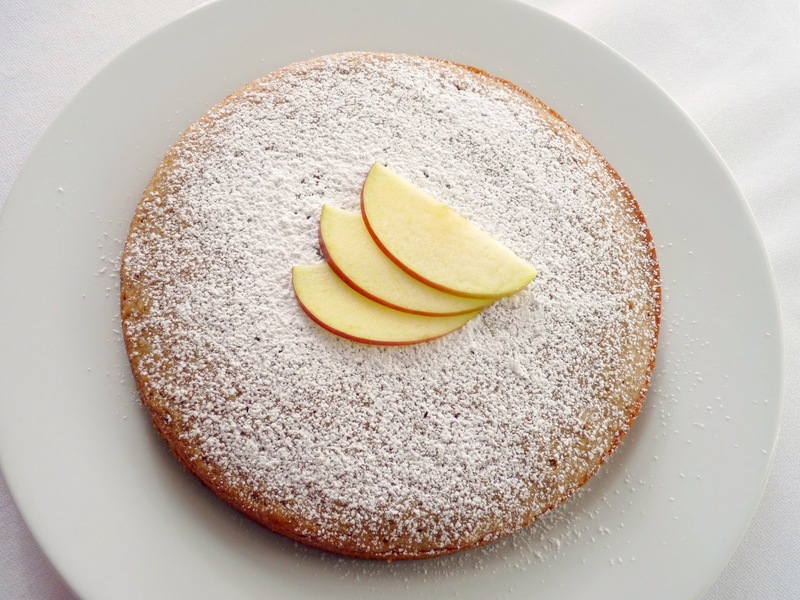 The texture of cake is a delicate balance between the ratios of flour, butter or oil, sugar and eggs. Omit the flour and you have a very soft texture. Replace some or all of the flour with ground nuts and you have a dense and chewy bite. Reduce the sugar or the eggs and you impact the tenderness. Butter also adds tenderness, flavor and a defined crumb. Oil will produce more moisture and a more open crumb. And leaveners, such as baking powder, baking soda and whipped egg whites, play an important role in texture as well. Introducing applesauce adds more moisture and is often used as a substitution for all or part of the oil or butter. 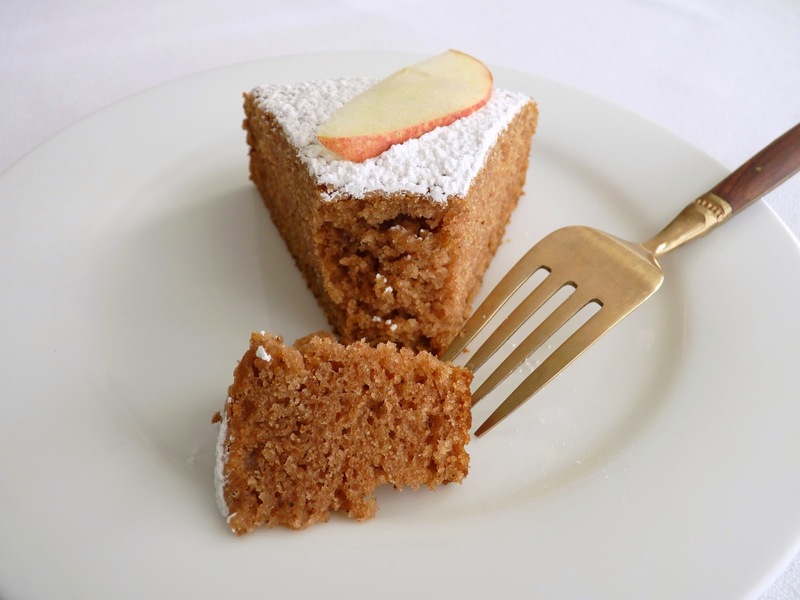 This cake manages to achieve a beautifully tender crumb using a combination of melted butter, oil and applesauce, a somewhat delicate task. It's so soft it practically melts in your mouth. And the ambitious blend of spices is intriguing and delicious. It's exactly the sort of wonderful bite of cake you'd love with a steaming hot beverage on a lazy late morning or afternoon as the clouds drift overhead. If you're a fan of easy and casual cakes, I'd say this is definitely one for your pastry recipe collection. - This recipe is from Food & Wine magazine and it's for a large bundt cake. I cut the recipe in half and made an 8" cake. Follow the link for the full bundt version. - I scaled back the applesauce a bit to 6 oz (about 3/4 cup) because I wanted to make sure the cake had a defined crumb. 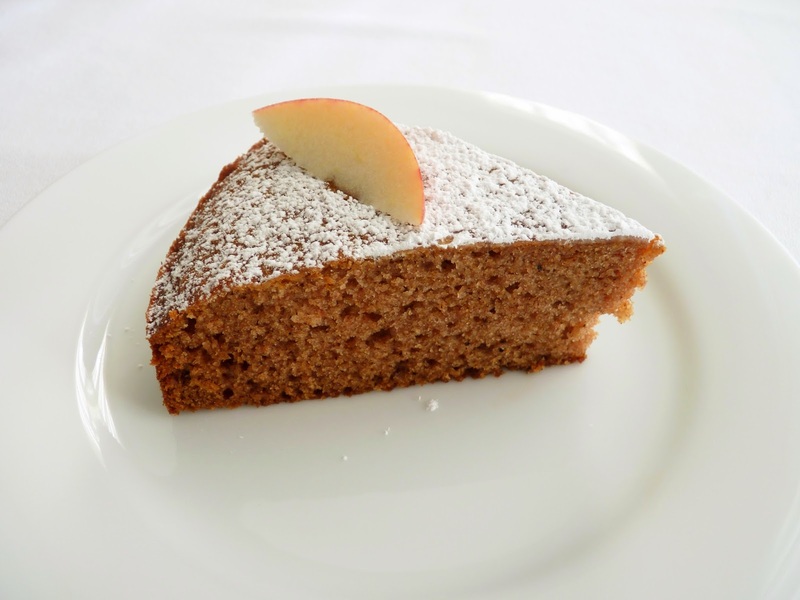 Sometimes a lot of applesauce in cake formulations can create a texture that is slightly gummy. - The recipe calls for the addition of semisweet chocolate chips but I left them out. If you prefer, fold 6 oz (1 cup) into the batter at the end of the mixing process. - The cake can be stored in an airtight container at room temperature for about 3 days. As with most pastries that have a lot of spice, it tastes even better the next day. Preheat oven to 350 degrees F. Lightly grease an 8" cake pan and line the bottom with a circle of parchment. In another bowl, whisk the oil, melted butter and sugar until blended. Add the egg and applesauce and combine thoroughly. Whisk in the flour mixture just until there are no streaks of flour. Pour the batter into the prepared pan. Bake until a tester inserted in the center comes out with a few moist crumbs attached, about 28 - 29 minutes. Remove the cake to a wire rack to cool for 10 minutes. Invert the cake and gently remove the parchment. Invert again and cool completely. Dust with powdered sugar. This seems like a good time to make some cookies, to take a moment to share a comforting little bite of pastry to soothe the transition into this season of very cold weather in the new year. Crank up the oven and make yourself a little treat to take the edge off the dreary clouds hovering nearby. This cookie is nothing fancy. 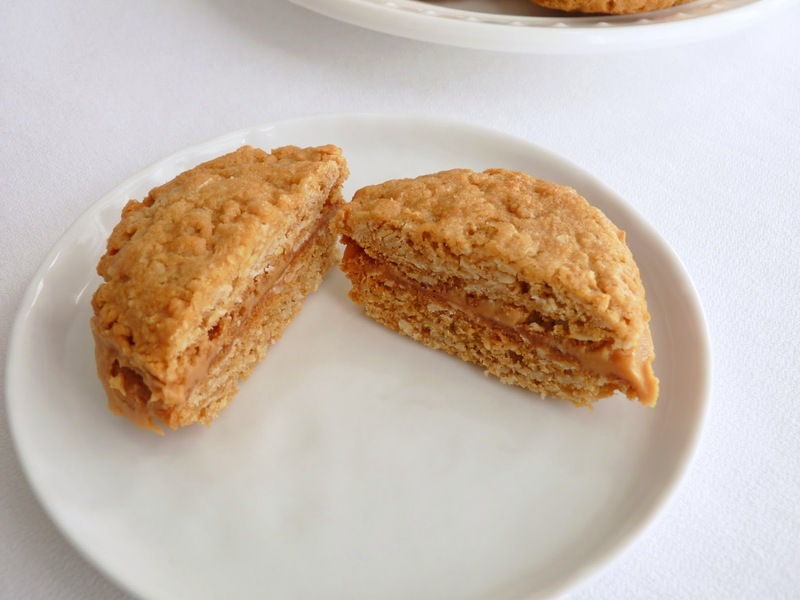 It's a chunky sandwich cookie in the American style made from ingredients you most likely have in your pantry. 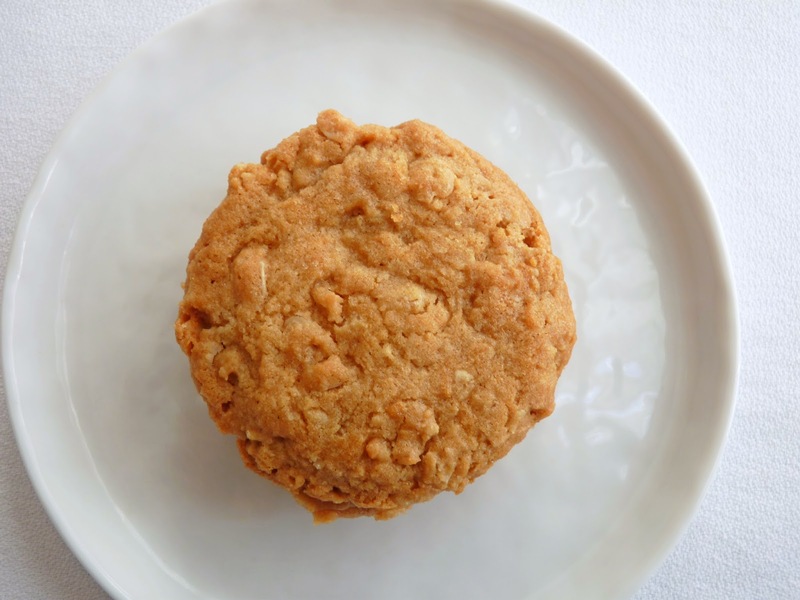 It starts out as an oatmeal cookie flavored with a nice punch of peanut butter. The texture is crunchy but the oatmeal also adds a satisfying chewiness. 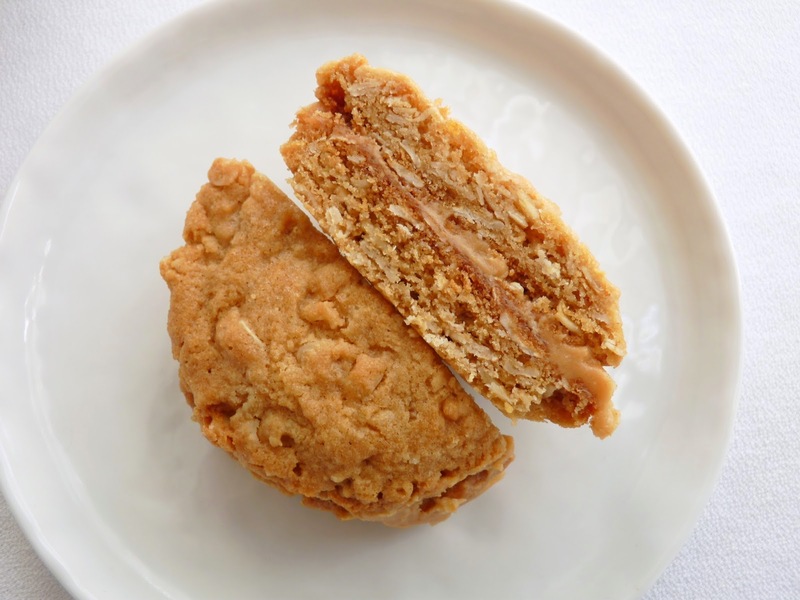 The cookie is sandwiched with an easy peanut butter filling for some contrast in texture. They're not too sweet and there's a nice edge of salt to pique your taste buds. Very simple but not plain, perfect for a moment of pleasure with a hot beverage. Stay bundled up and warm, everyone! - I used creamy peanut butter but use crunchy if you'd like more peanutty goodness. - A #40 scoop (1 tablespoon) is perfect to portion the cookies. - The cookies will feel soft and crumbly when you remove them from the oven but will firm up once they cool on the baking sheet. 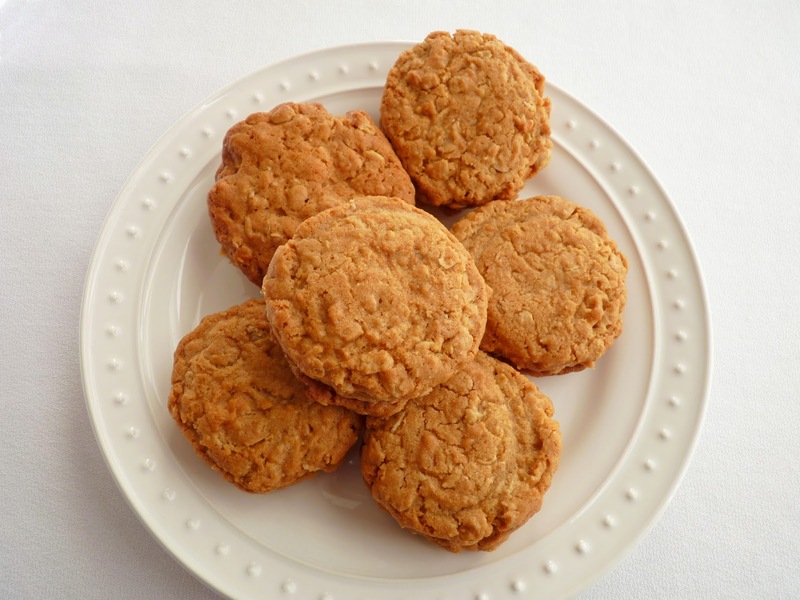 - The cookie is also good without the filling if you prefer a simpler approach. Sift the flour, baking soda and salt. Whisk in the oats and set aside. Cream the butter and both sugars until light and smooth, about 3 minutes. Add the peanut butter and blend. Scrape down the bowl. Add the egg and vanilla and mix thoroughly. Scrape down the bowl and add the flour mixture. Mix just until there are no streaks of flour. Scoop the cookie dough into 1 tablespoon portions and place them close together on a lined baking sheet. Flatten them a bit. Wrap and chill until firm. Preheat oven to 350 degrees F. Line baking sheets with parchment or silpats. Place 12 cookies per sheet pan. Bake until golden brown, about 14 minutes. Place the baking pans on a wire rack and let the cookies cool and firm up before removing. For the filling, stir all the ingredients together, adding milk until the mixture is spreadable. Spread on half the cookies and top with the remaining half. Happy New Year! Let's get 2014 started. 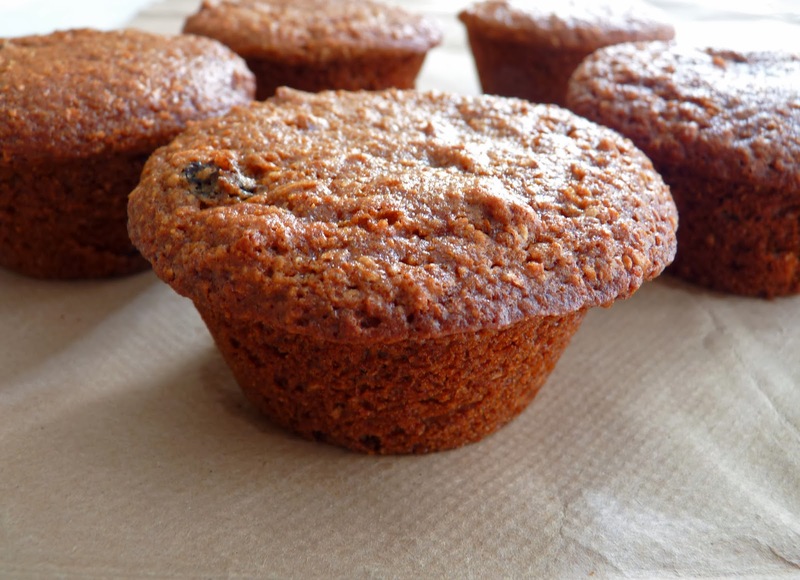 After a solid month of annual extravagance, if you find yourself in the mood for something for breakfast, brunch or a snack that isn't completely decadent and more in the back-to-basics lane, a Buttermilk Bran Muffin just might come in handy. But don't be alarmed. I promise I am not delivering a Torture Muffin. Baking has come a long way since the days of whole wheat pastries that instilled fear. No longer do breads and pastries made with whole wheat flour and bran have to taste like a mouthful of sawdust. I do not think of these muffins as punishment. 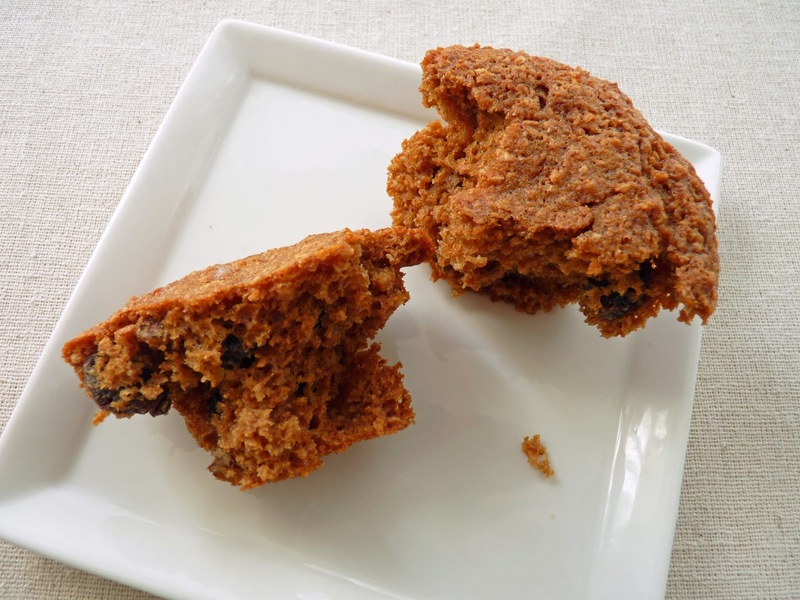 They are soft and full of flavor, thanks to a good dose of molasses, vanilla and orange zest. Pecans and raisins add more flavor and texture. There is just enough wheat bran to enrich but not dry out the finished product. Buttermilk helps to leaven and tenderize the gluten. This is a good muffin of choice for a simple and humble beginning of a new year. - Wheat bran can be found at bulk food grocery stores. Bob's Red Mill also offers it. - If your raisins are dry, plump them for about 5 minutes in just enough hot water to cover. Drain thoroughly. - The buttermilk and bran mixture will look like mush. - Whisk in the flour mixture just until moistened. Do your best not to over mix! - Keep a close eye on the muffins as they bake. They don't take much time at all and will be dry if over baked by a minute or two. - If you despise raisins, try a couple of tablespoons of finely chopped crystallized ginger. Or maybe make a resolution to give raisins another chance! 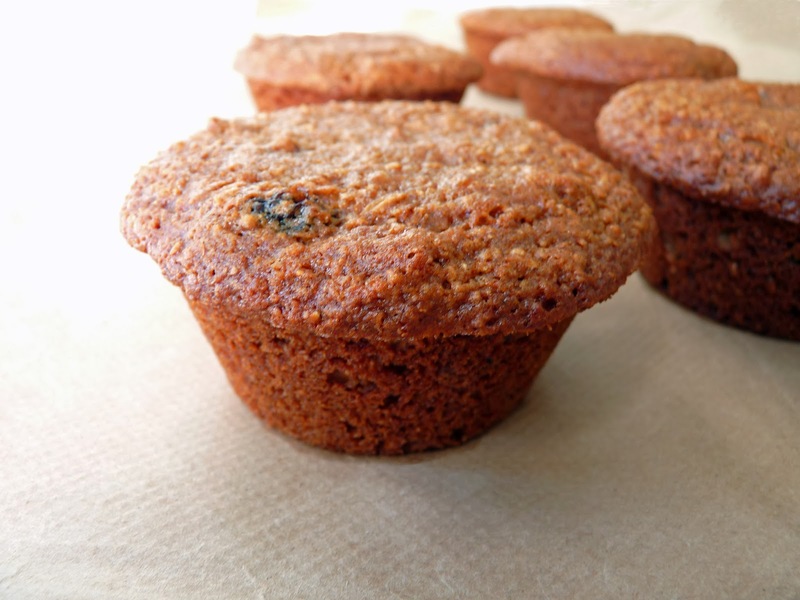 Preheat oven to 350 degrees F. Grease 16 wells in standard size muffin tins or use paper liners. Place the buttermilk and bran in a bowl and stir to combine. Set aside. Sift both flours, baking soda, baking powder, salt and cinnamon. Set aside. In another bowl big enough to hold all the ingredients, whisk the oil, brown sugar, molasses and honey. Add the eggs and combine thoroughly. Mix in the vanilla and orange zest. Add the bran and buttermilk mixture. Whisk in the flour mixture just until there are no streaks. Do not over mix. Fold in the raisins and pecans. Divide the batter equally in the prepared muffin cups. Bake until the muffins spring back when pressed gently in the center or a tester inserted comes out clean, about 13 minutes. Place on a wire rack to cool for 10 minutes. Use a small thin knife or small metal spatula to remove from the pan. Cool completely.